Play the best songs note for note. 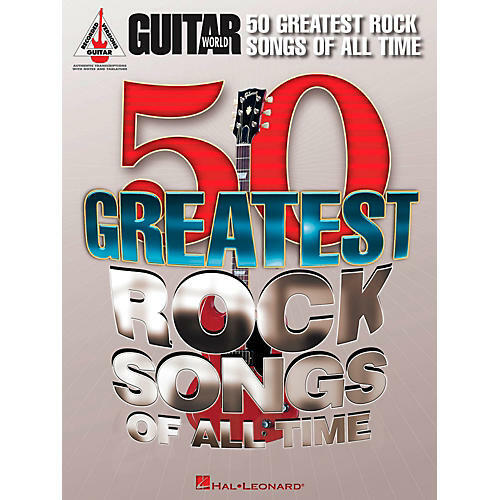 Guitar World's 50 Greatest Rock Songs of All Time: the name says it all: the 50 best as decided by the experts at Guitar World magazine transcribed note-for-note. Titles: All Along the Watchtower • All Day and All of the Night • Barracuda • Bohemian Rhapsody • Carry on Wayward Son • Crazy Train • Detroit Rock City • Enter Sandman • Free Bird • Highway to Hell • Hotel California • Iron Man • Layla • Misirlou • Pride and Joy • School's Out • Smells like Teen Spirit • Smoke on the Water • Sweet Child O' Mine • Tush • Welcome to the Jungle • You Really Got Me • and more. 512 pages.